The Pickledish Patch: Sent packing! Well my Christmas project is….. Sent packing! Well my Christmas project is….. Finally finished. This project I have been working on is all packed up and ready to go to Patchwork & Stitching Magazine for Christmas issue coming up. I might be able to have the pattern up for sale in my Etsy shop real soon for all the non Australian Christmas pattern lovers. I love green and red together….just gawjus! There’s been a bit of Christmas sewing going on and I have another one that I have to finish writing up the pattern for and get that sent off too. Will show you a bit later on. and don’t forget my Sale of my patterns from my Etsy shop is still going. 50% off all the patterns in my Etsy shop. Also I am excited to tell you that over at In Stitches blog there is a Spring Bingo Fever happening as of next week. So pop on over and pick your Bingo list and have some fun. Awesome prizes will be given out to some lucky winners and I was lucky enough to win one last year when they had it running. That "sneak peak" looks very festive. Another project and well done. Sorry I'm late Vicki... Happy Birthday!!!!!!!!!!! Sounds like it was wonderful. eak peek looks lovely it includes two of my favourite things ric-rac and yo-yo's can't wait. Thank you for pointing me to the Spring Fever Bingo, it looks great fun. Sounds like a great b'day, I love Italian Food and just had an eggplant sandwich for breakfast - it was more than gawjus!! Being from New York originally I got a major chuckle out of that!! I love the bingo too and congrats on the pattern. Every once in awhile I find P&S so I'll look for it. Well for some reason the pic didn't load for me, but I just know it's lovely, Vicki! Your birthday sounds so fun - love the "squishies", lol! Your sneak peak brings home just how close the Festive Season is! I love sneak peaks! Looking forward to seeing your project in all it's glory . Glad you had a great birthday ! Hi Vicki, Glad you had a good birthday. I went shopping yesterday (30 minutes from home) and picked up a copy of Quilters Newsletter great article!! I haven't bought this for a while its full of goodies!! That looks like a very lovely sneak peek!!! The sneak peek looks interesting and thanks for letting us know about the Spring Fever Bingo. A belated Happy Birthday! 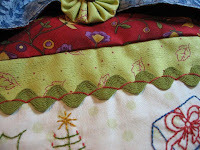 I love the way you used ric rac in the quilt we got a sneak peak of. (Boy that's not very good English is it? )I'll be checking for the big reveal.